Sources say Yosemite National Park is adjusting well so far to its tighter temporary office space. SACRAMENTO, CA—Officials at Yosemite National Park confirmed Friday that in an effort to accommodate necessary renovations and expedite routine maintenance, the entirety of the park’s breathtaking wilderness has been temporarily relocated to a Sacramento office space. Earlier this week, Yosemite employees said, they transferred thousands of lakes, 1,600 miles of streams, colossal stretches of old-growth forest, 250 species of vertebrates, Bridalveil Fall, and countless granite crags to a 3,000-square-foot commercial office space in the local North Pointe Business Center, where they’ve since been busy settling into their new workplace. 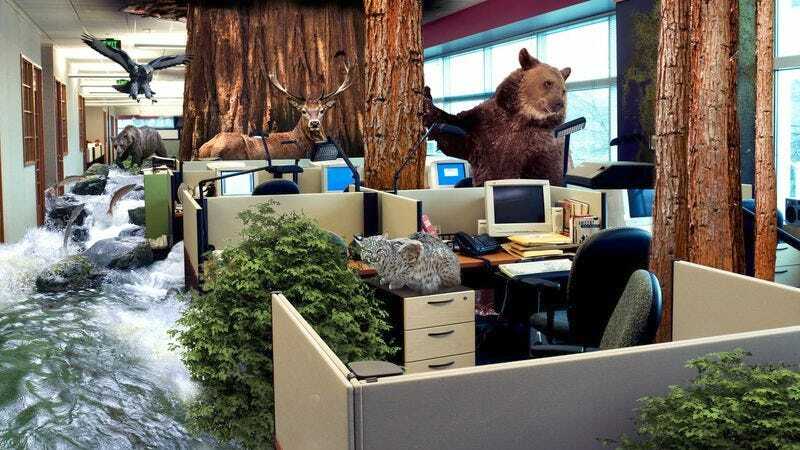 “Sure, the herd animals are used to roaming across a larger expanse of terrain, but we feel the open-floor office plan we have here is really working to their advantage,” he added. Neubacher acknowledged that the new environs had been an adjustment for many of the animals, noting, for example, that the park’s marmots initially seemed upset about having to share a cubicle with its black bears. But before long, he said, the marmots had burrowed down into a recycling bin to hibernate, and the bears had discovered the kitchenette, where they ripped the door off the refrigerator and devoured everything inside. There are other inconveniences: Space constraints reportedly forced employees to move a number of the park’s larger mountains and river systems into off-site storage units, and most of Yosemite’s astonishing diversity of plant life is now confined to pots lining the windows of workspaces. On top of that, sources stated, the 1,900-year-old giant sequoia tree in the office’s reception area requires almost constant watering. According to sources, the park’s presence in the office complex has been hard to ignore, with the forces of nature—whether it’s the vast alpine woodlands in the mailroom or a terrified owl stuck in the revolving doors—occasionally intruding on public spaces. But even if from time to time they open the door of a restroom stall and are startled by the sight of a cougar tearing into the belly of a bighorn sheep, Yosemite’s fellow tenants told reporters they don’t generally mind. Despite the fact that they’ll have to find a way to accommodate the several hundred thousand campers, hikers, and rock climbers expected to visit their Sacramento office between now and Memorial Day, when renovations on their permanent location are complete, Yosemite officials said they believe selecting a temporary office will have been the right choice.